This year’s TNW Europe was not only a festival-like conference full of great talks, epic parties and irresistible catering – it was also the opportunity for 200 of the hottest international startups to present 9,400 tech influencers, investors and journalists the next game-changers. Besides exhibiting and many other perks, our startup program Boost included two pitching rounds – the startups that impressed on the first day got invited to face a larger audience and strict jury on an official TNW Europe stage. 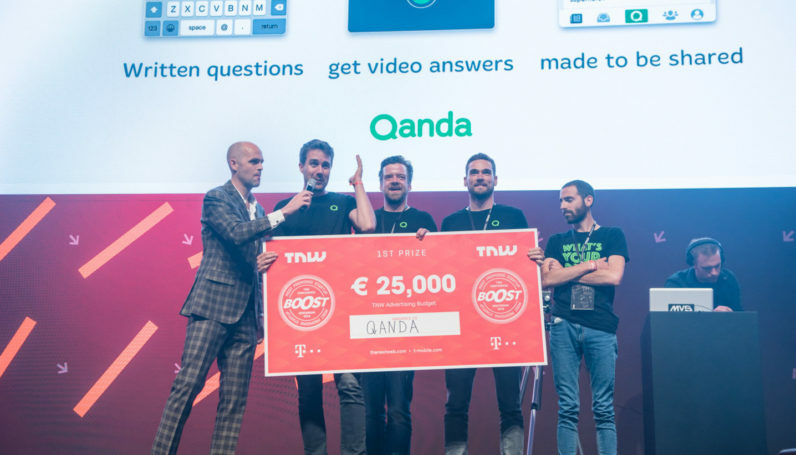 In the end, one startup managed to fight off the fierce competition and come out on top, claiming a huge trophy and €25,000 prize: Qanda from France. You simply send your question and get a video answer in return. The app then combines the question and answer to create a video player that’s ready to be shared all over the internet. Ecstatic: Qanda founder Martin Verpaalen with the Boost trophy and prize money. Congratulations guys! We’re sure this is the start of something big. ➤Try out Qanda here, and don’t forget to sign up for your 2-for-1 ticket deal for TNW Europe 2017.